Lessen the look of dark circles and puffiness with Celavive® Hydrating Eye Essence. You still have a youthful twinkle in your eyes. Frame them with bright, younger-looking skin that exudes vivacious vitality. Visibly reduce the appearance of dark circles, puffiness, and fine lines with Celavive® Hydrating Eye Essence. Aging dries out and wrinkles this sensitive skin. A unique blend of powerful peptides and botanical extracts helps revitalize youthful-looking eyes. Treat your most delicate skin to this lightweight, ultra-hydrating formula. 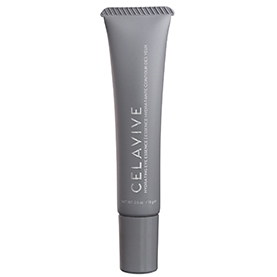 Celavive Hydrating Eye Essence does this with a high concentration of active ingredients. It’s packed with Celavive Cell Signaling Complex—formulated using USANA InCelligence Technology®. Counteract the appearance of fine lines and wrinkles using this combination of two bioactive peptides and botanical extracts. Your response to these ingredients will be specific to you. The formula targets key skin receptors to help your body bring out the look of your unique youthfulness. Your eyes tell a story. So, project your brightness and youthful vibrancy to the world with Celavive Hydrating Eye Essence. This unique formula contains bioactive peptides, botanical extracts, and plant oils to illuminate three elements of visibly younger-looking skin—brightened, smoothed, and moisturized. Key ingredients work together to reverse the visible effects of aging. 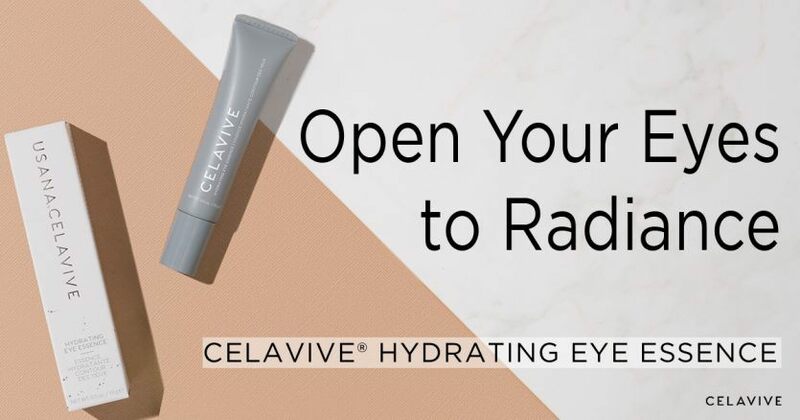 Utilizing Celavive Hydrating Eye Essence on a regular basis can visibly reduce the signs of dark circles, crow’s feet, fine lines, and wrinkles. Lessen the appearance of dark circles around your eyes. Using Celavive Hydrating Eye Essence helps you brighten your appearance and highlight that youthful sparkle in your eyes. Aging is one of the main culprits. As you get older, your skin thins and you lose fat and collagen—a structural protein. The skin around your eyes is already very thin, so it’s easy for blood to show through. Losing these structural components as you age makes the blood vessels more visible. Combat many of these factors to brighten your skin with Celavive Hydrating Eye Essence’s powerful combination of ingredients. You can help revitalize the skin around your eyes with two stimulating extracts—Ginkgo biloba leaf extract and Albizia julibrissin (Persian silk tree) bark extract. Ginkgo isn’t just for your brain. It contains quercetin—a phytonutrient that exhibits antioxidant activity and helps minimize the appearance of redness. The bark of the Persian silk tree reduces the visibility of crow’s feet and dark circles. Another ingredient that can help you look well-rested is glucosyl hesperidin. 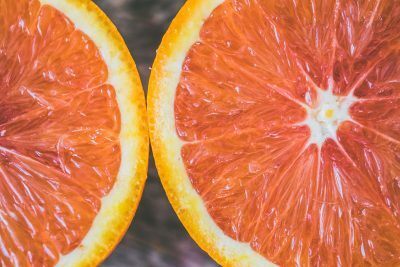 This antioxidant from citrus fruit helps revitalize your eye area to erase the appearance of fatigue. You can enhance the look of brightness and beauty with Hydrating Eye Essence’s Horus K complex. It helps refresh the delicate skin around your eyes to improve the appearance of bags and dark circles. This is a blend of Rosa canina fruit oil, avocado oil, apricot kernel oil, and sunflower seed oil that’s rich in naturally derived vitamin K.
The bioactive peptides of the Hydrating Eye Essence also help even skin tone, brighten complexion, and reduce the appearance of dark spots. You’ll find Hexapeptides 9 and 33, along with Oligopeptide-6 in Hydrating Eye Essence. Don’t be intimidated by the names. 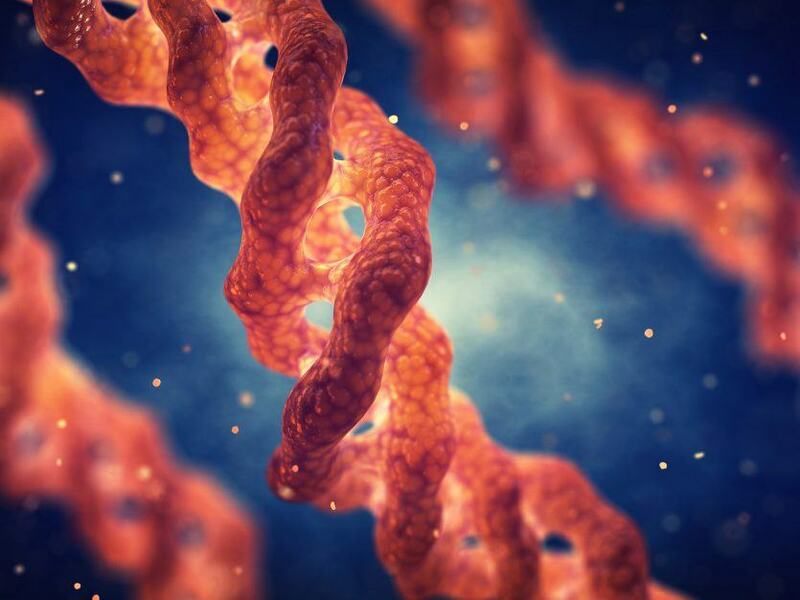 A peptide is nothing more than short chains of amino acids—the building blocks of proteins. These peptides penetrate the skin to deliver wide-ranging benefits for healthy looking skin. Smoothing out the impact of aging and your lifestyle is key to younger-looking skin. Nature and science combine in this hydrating essence to reduce the appearance of fine lines and wrinkles around your eyes. Let’s start with the science. The Celavive Cell Signaling Complex contains Palmitoyl Tripeptide-38, Hexapeptide-48 HCI, southernwood extract, and coffee-seed extract. Made with USANA InCelligence Technology®, this unique blend penetrates the skin to target key skin receptors. 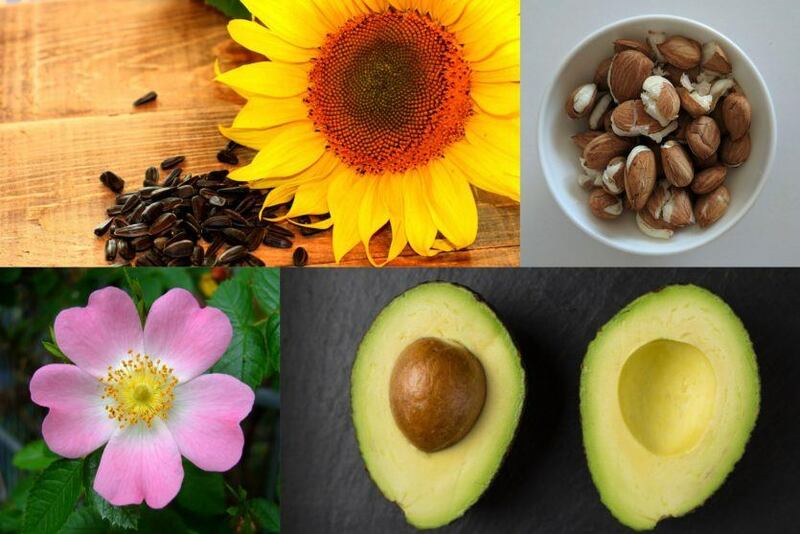 These ingredients help activate six major elements that can help produce a healthy skin matrix, including collagen, for younger-looking skin. 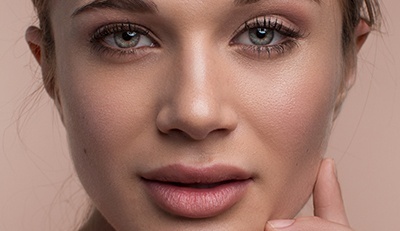 Collagen is the main structural protein in your skin’s connective tissues. But you make less collagen as you age. So, maintaining collagen is important for keeping your skin looking firm. 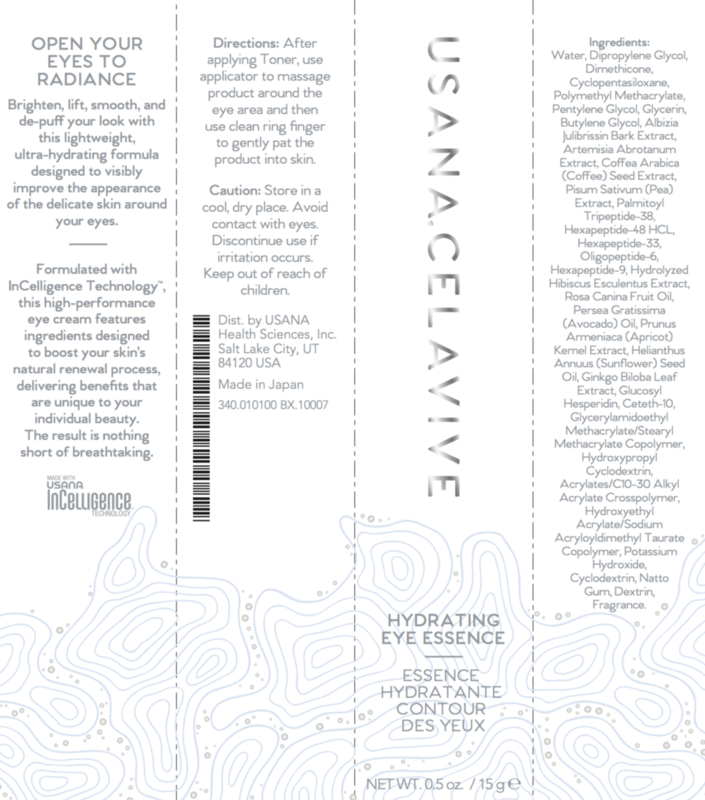 Hydrating Eye Essence delivers even more powerful action with added Hexapeptides 9 and 33, as well as Oligopeptide-6. This trio of potent peptides also hydrates and protects collagen in different ways to leave skin looking visibly lifted. These powerful ingredients reduce the visual intensity of facial wrinkles and also help keep skin looking smooth and refined. Persian silk tree bark extract (Albizia julibrissin) smooths the look of the skin to remove the appearance of wrinkles. Pea (Pisum sativum) extract helps skin look tighter and firmer around the eyes. Hydrolyzed okra (Hibiscus esculentus) extract helps smooth expression lines. 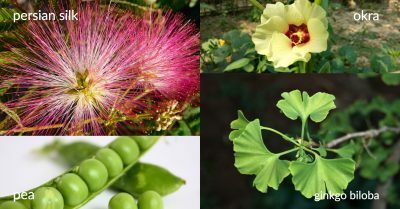 Ginkgo biloba leaf extract plays several roles in maintaining skin beauty. That includes helping to mask the visibility of imperfections and wrinkles to preserve smooth skin. It’s no coincidence that the product is called Celavive Hydrating Eye Essence. 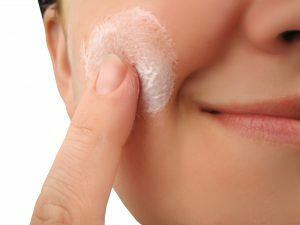 Age and lifestyle factors can dry out skin. But you’ll soak up the hydration you need to look younger and healthier because of these influential ingredients. The Horus K Complex in the Celavive Hydrating Eye Essence contains a variety of plant oils that provide impressive amounts of moisture. That’s because the oils mimic your sebum—natural skin oil. This allows the complex to naturally moisturize without irritating the delicate skin around your eyes. And the fatty acids in these oils help promote a silky appearance. The peptides in the Celavive Cell Signaling Complex also help with hydration. It helps stimulate lipid production for a more moisturized complexion. Additionally, these messengers target receptors in your skin that help promote healthy levels of hyaluronic acid for a visible plumping effect. If you’ve never heard of hyaluronic acid, it’s an important component of your skin. It has the ability to retain water, which makes it essential for skin hydration. 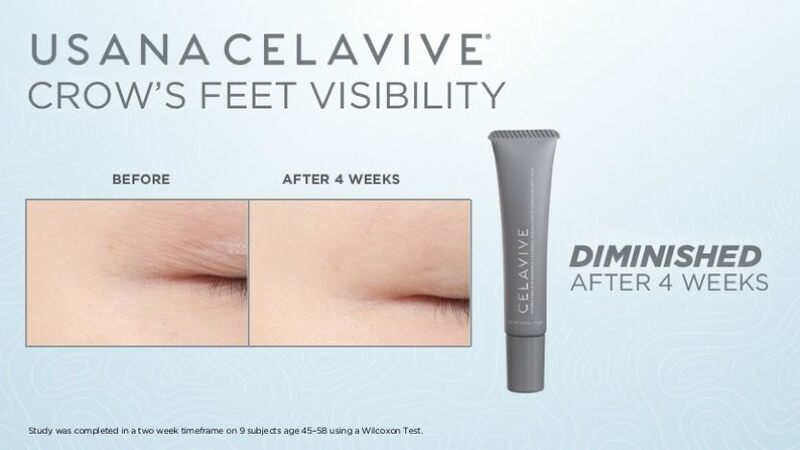 Directions: After applying Celavive Perfecting Toner and Vitalizing Serum, use applicator to massage product around the eye area and gently pat the product into your skin with ring finger. Submit your question at the link at bottom of page. 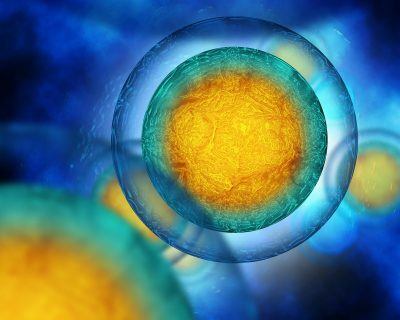 Cell signaling is essential for your health. It can come in the form of chemical compounds, mechanical stimuli, and electrical impulses.